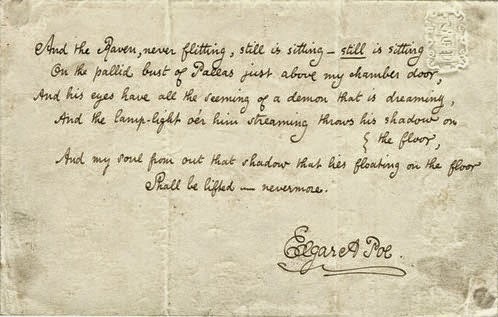 Happy Halloween: Edgar Allen Poe's "The Raven"
This image is a handwritten page from The Edgar Allen Poe Digital Collection at UT Austin. It's the last stanza of The Raven, written by Poe. 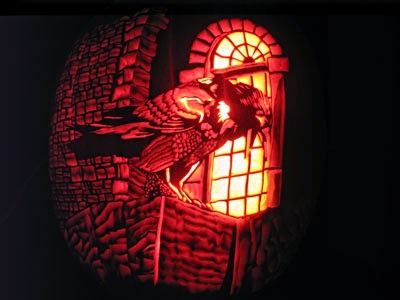 If you're interested in Poe, check out their archive, they have some neat items, including an illuminated manuscript with several of Poe's poems. Enjoy and have a safe and happy holiday!! With November looming large on the horizon, I'm staring a month of utter misery in the face. I have so much to do, and I'm not sure how I'm going to actually get it all done. I have to write a proposal, take an exam, read four plays & three books, give two presentations, write four small response papers, and two long papers, all the while working -- in the writing center, observing classes, and teaching labs-- and going to class... oh, and did I mention I have a performance review on Tuesday? To say I'm terrified about that is an understatement. So yes, November spells doom, and if I make it through, I'm going to be ready for the Christmas break! Hell, I'm already ready for Christmas break and it's still a month and a half off. The only really good news is that the semester is on the down-slide. Thank goodness! In many ways, I utterly despise November. So, in an attempt to make myself more insane, I've decided that I'm also going to give NaNoWriMo a shot again. Call me crazy, but I just can't give it up! Will I fail? Most assuredly, but it's not about finishing, it's about giving it a go. It's about the ritual of it. It's been a part of my November since 2004, I can hardly quit now. It's something I do, something I enjoy immensely, and something I'm unlikely to give up any time soon. Do I feel like I'm piling on? Oh yes. Yes, yes. Still, I can't see my way to skipping it this year. I may not finish many things I start, but at least I don't give up on starting them. I'm persistent! 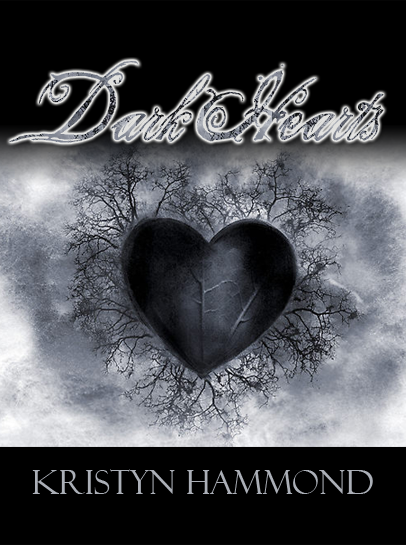 My novel in progress, as you may have noticed from the empty progress meter on my sidebar, is tentatively called Dark Hearts. It's going to be a fantasy novel about a slave girl in a world where Vampires are born, not made, and live openly like any other society. I'm not 100% certain where I'll go with it, but I know who some of my characters are and I know what the setting is, so that's enough that I might start writing and see where it takes me. Who knows if I'll finish, lord knows I haven't finished either Love's Daughter or Remembering Tomorrow but I'm confident that I'll actually finish them some day and Dark Hearts will be no different. Something to look forward to in the future, when I have a minute or two, perhaps after I've graduated? That would be lovely. What you're seeing over yonder, on the right hand side of the text, is the concept book cover. I create them for all novels in progress these days. If you've taken a gander at the "Novel" page on this blog, you've probably seen the other two, also. The one thing they have in common is the hearts, because I love them and because in some way they all have meaning to what's going on in the books. I feel like this cover, which is clearly for my benefit and not an actual cover that could ever get printed --especially considering I have no idea to whom I might attribute the art, nor pay for use-- captures the heart of what I'm trying to achieve with this book. I don't know why, since it's not even begun, but for some reason, it inspires me. I'll take inspiration wherever I can get it, so this is a positive thing! Ultimately, I keep telling myself that I'll get ahead or that it'll be okay. Do I believe it? Not really, but I'm trying to remember that if I take things one day at a time everything will work out. Do I believe it? Not really. So what about you? Doing NaNoWriMo? If so, good luck. If not, check it out, you might just appreciate the exercise in... determination! So, now that I've regaled you with my tales of woe, onto something much less gripey (gripey... is that a word?). On October 15th I went to my first professional conference! I was so excited to be able to go, and though it's a small conference by comparison to some of the others, it was pretty exciting. Some of the writing center staff (most of the GA's and one of the undergraduate tutors) went to the North Texas Writing Center Association Fall conference, held this year at TCC's Trinity River campus in Ft. Worth. I rode to the conference with my friend, co-worker, and student cohort Marsha and her husband, Randy. It's only about an hour drive, but there was no way I was driving myself. I can't deal with the traffic, so it was nice to be able to ride with them! The TCC Trinity River campus is brand new and it's absolutely gorgeous. I would have pictures to share that were actually taken by me were it not that the camera on my cell phone is horrible; I can't even take pictures up close, let alone ones at a distance! I should have taken my camera, but I forgot. So, you get this great photo I swiped off another site. Isn't the campus lovely?! Anyway, we got there a little early and had to navigate the levels. We were told to park in a specific spot, on level four, but when we got into the building we realized that parking level four is actually floor three, so we were a little bit lost. We figured it out, but it was an adventure and I know the students thought we were crazy. The conference room itself was beautiful, but it was also freezing! I can't believe how cold it was. I'm use to being cold, since Matt runs the air conditioner year round, so it hardly phases me anymore, but I was absolutely freezing. I was wearing a sweater, even, and thank goodness. I really think the cold ruined the atmosphere a little bit and we kept thinking that when everyone got into the room it would warm up, but that didn't turn out to be the case. It just kept being cold, in the conference room, in the hall, in the bathroom, freezing! I really felt for the woman who had come wearing a skirt, her legs exposed. There were only about 30 or so attendees from across North and Central Texas colleges, everything from Writing Center directors and tutors, to adjunct and administrative staff. The hosts were really nice and lunch was provided to all attendees, which consisted of a voucher to use in their on-campus cafe. Their cafe was so neat, they even had a genuine brick oven pizza place where you could make your own pizzas and they were fired in a real brick over. I had the pizza and it was amazing! Even the dining room had a lovely atmosphere, complete with a conveyor where the lunch trays and trash went to be taken into the kitchen and washed. I just can't say enough about how amazing this campus really was. Our Writing Center directors at Tarleton are the President and Vice President of the association, but they weren't actually able to go to the conference this year because they were both ill. So, we went and tried our best to make them proud anyway. The conference's key note speaker was really interesting, discussing the issue of how assessment can be successfully tied to writing centers. Marsha and I were on a tutor panel, with four students from other schools, discussing how working as a writing tutor had changed our lives outside the writing center. It was the first time I've spoken at any kind of conference, but it went really well and makes a nice first entry for my CV! All of the people at the conference were really friendly, so that made speaking in front of so many people easier. They say it's hardest to speak before ones peers, imagine speaking in front of ones superiors. It's terrifying, but the attendees were welcoming and made us very comfortable. It was actually really neat because I mentioned that what makes the job really fulfilling is the "Ah ha moment." After that, it caught on and everyone was saying "ah ha moment" which made me feel really good as a contributor. This whole thing was also right in the midst of my sickness, where I was coughing up a storm and had almost no voice. I almost didn't go at all because when I woke up that morning I couldn't speak, but I managed to pull it together, get there anyway and I'm really glad that I did. I sounded terrible and I know I was difficult to hear, but in all it was a really rewarding experience and we got to meet a lot of really neat people. The next conference is going to be the CCTE (Conference of College Teachers of English) conference in the Spring, which is being held at Tarleton this year! We've been told that since it'll be at our school we'll probably actually be working the conference, but even if we're not, we'll be going. After that the Southwest Texas Popular Culture and American Culture Association conference, which will include not only the regional, but also the national together this coming year in San Antonio! I'm looking forward to going to both and I'm considering submitting an abstract for consideration to the Pop Culture conference, if I can get a proposal together by December 15th. That's a big if, since I've got a lot of schoolwork to do before then. Either way, we're going to plan to go. I know Marsha's planning to go, but I'm hoping Melanie and Nikka will, too. It would be neat to be able to all be there together, especially since it's so close to here -- about 4 1/2 hours, but that's really close for Texas. I simply can't wait!! I can hardly believe it's nearly November! Time has just flown by, and as usual the things I've had to neglect to get everything done have been those things I enjoy most... like blogging. I'm working the Writing Center hours in the library tonight (5-8 p.m.), which I only do once a month right now because the GA's rotate, and since it's really quiet I thought I'd get a word in while I have a chance. I actually have a ton to say, so much in fact that there's no way I can fit it all in one post without it being brutally, unsympathetically long. So, I'll break it up, though I have no idea where to even begin because it's been so long. Chances are, things will be forgotten because there's no way I can recount so much in so little space. Fortunately, most who read here with any regularity are my friends on Facebook or Twitter, so they get my updates in fits and spurts. Okay, enough with the introduction already, I'm getting bored with myself (never a good sign!). I'm actually enjoying the cooler weather that fall brings, even here in Texas where fall is an illusion we pretend behind because it's still 85 degrees at the beginning of November. In all fairness, it has actually been in the 70's most days, making the facade of fall easier to swallow. Though I have been enjoying it, I've been sick for a month which makes it a little bit more difficult. I suppose you can't really call it sick, but I've been something. It started with a sinus infection and I felt horrible! I was sick for several weeks but started to feel fine, with the exception of a nagging cough and persistent case of laryngitis. Talking is the biggest part of my job, so not being able to speak is a real bummer. Matt finally insisted that I go to the doctor, which I did, and they said that I wasn't sick --something I knew-- but rather that I was suffering from some sort of allergic reaction. Unhappily I started taking Allegra and Tessalon (cough meds), but the fact is, the allergy could be to absolutely anything. I started to wonder how I might narrow it down, after all, I have a cat and dog, my husband smokes, the pollen count's extraordinarily high thanks to the lack of rain, my house is dusty, the offices I work in are dusty, the classrooms are dusty, I'm allergic to dozens of foods, and every time I get in the shower I sneeze. Not good, at all. The first thing the doctor asked me was whether or not I smoked. I told her no, but that my husband (and everyone in my life) does. She said, rather rudely, that I smelled like smoke (bitchy old woman!) and I should tell my husband to smoke outside. With that exchange in mind, I asked him if he wouldn't mind doing so. Guess what, I started to get better. This is both good and bad, since I really feel awkward asking him to smoke outside forever. He helps to pay the bills, it's his house too, and I knew he was a smoker,and that I was allergic to smoke, when I married him. So how could I now make him smoke outside? It was a real problem for me, especially since he sort of made me miserable about having to go outside to smoke. He'd make a big deal about how annoying it was every time he had to go out and it made me feel about an inch tall. It's not my fault that I'm sick and suddenly developing a horrible allergy to something I've been living with for years, but it's not his either. Still, he did it, begrudgingly and though I felt bad, I could speak again and wasn't coughing nearly as much. Fast forward to this last weekend. It was raining on Saturday (finally!!) and since we don't have a patio I couldn't very well tell him he had to go outside into the rain to smoke, so I thought it might be okay for him smoke inside. By the time the day was winding down, I had almost no voice again and I was coughing like crazy. More than that, it hurt to use the breath it took to speak. My chest literally hurt with the effort to force breath up and out. Sunday, the sun was shining, but he continued to smoke inside and I continued to cough and my voice sounded terrible! So, surprise, surprise, it has to be the smoke I'm having a reaction to. In addition to a horrible allergy reaction, I think I'm developing asthma. This is bad, especially since everyone in my life smokes. Sadly, I'm not sure what to do about it. There has to be some happy medium. Matt can't smoke outside forever, but he can't smoke inside either because it makes me sick. He smokes inside when I'm out, or when I'm sleeping, and that seems to be okay, but I think the lingering bit of nagging yuck that keeps me coughing is probably a result of being in an environment where smoke has permeated everything. It's also pretty depressing because all my friends are smokers and I can't very well ask them not to smoke around me just because my body has decided to do something completely annoying. Take for example last night, when I went out to coffee with two of my girlfriends after class. I woke up this morning coughing like crazy, my voice cracking. Both of them smoke. I knew they smoked, this is nothing new, and going out was my suggestion because I don't see them nearly enough. So, I'm frustrated and have no idea how to approach an answer that will work for everyone. I can't very well live in a bubble, where no one smokes and the environment is filtered. I want to be able to do the things I've always done and hang out with friends the way I always have, without having to worry about whether or not their cigarette smoke is going to make me sick. On second thought, maybe I should look into a bubble. Alright, enough complaining. I didn't expect this post to turn into a pity party or a bitchfest, so I'm going to sign off for now. If, however, y'all have any creative solutions to my problem, please feel free to make suggestions. I welcome any ideas. * "WTB" means "Want to Buy" in WoW lingo. I've changed my theme... again!! I'm sure you've noticed, but I always feel obligated to write a post when I make changes. I spent more than a few hours yesterday, while halfheartedly watching football, looking for a good fall-ish theme. 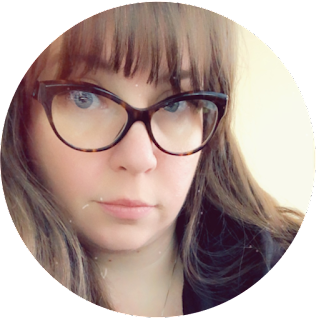 I searched every way I could think of, looking for fall, autumn, or Halloween themes for WordPress and all I came up with were ugly, ugly, ugly themes! Since I don't want anything that's going to scare you, or me, away, I decided on a different approach. Instead, I installed Vigilance, which I love, and stuck a banner on top, which I made! Now don't get me wrong, I didn't take that picture, rather I found it on DeviantArt. Isn't it pretty?! I just got tired of looking at the pink, lacy theme. I love it, that much is certain, but it doesn't reflect the fall. I want something, right now, that speaks to the autumn season -- my favorite season, in fact! I love everything about it, from the cool crisp weather to the spicy scents of autumn baking. Love it! I enjoy the winter, but it's often too cold, and the spring, were it not for my horrible allergies, and I absolutely hate the summer because I can't well tolerate the heat. No, the fall is the ideal season for me in every way! Okay, maybe not every way. Like all things, fall signifies a semester of school and work. It also brings a root canal this year. So, it's not all joy and happiness, but I love it anyway. So much so that soon I'll be getting everything I need to do the fall baking. I don't have a lot of time to bake, but when I do, I'll be making pies, both pumpkin and apple, pumpkin and banana bread, and maybe even Mom's sundae cookies or maybe some persimmon cookies. Best of all the fall brings Halloween, wherein much candy corn is consumed, and Thanksgiving, which we will be spending with dear friends this year! It also brings NaNoWriMo, which I will be again attempting, though I will likely fail to win. It has become a part of my yearly ritual, something I look very forward to, and not something I'll easily give over, even though I don't technically have the time. So if you're doing it, and we're not writing buddies, look me up and we'll support one another though the challenge. Anyway, I hope you like the new theme. It's clean and bright, but reflects the season. I like it! So tell me, then, what's your favorite season? Has it really been more than two weeks? Wow, this past month or so has just flown by in a blur of exhaustion! I've been so tired, so posting here has been something I've strove to do, if not something I've managed to actually get done. It's not that I have nothing to say, I have plenty to say, it's that I'm worn out. That said, I'm so happy to have time to be able to blog tonight! 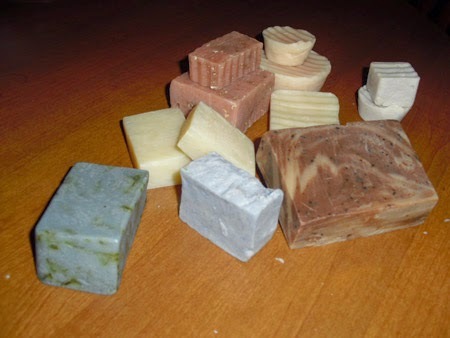 Several weeks ago, my long-time-friend Mayren sent me a package of homemade soaps to test. She and I have been friends for eleven years this month, we met in October 1999. Now, she's in southern California and has recently taken up soap-making. I was so thrilled to get them and they were in such good shape when they came. I tore them open, identifying each of them by scent and with the guide she sent me. Each soap was carefully wrapped with newspaper and labeled with a number. By the time I was done smelling them, they were all laying out on the table together, so I took some pictures and then packaged them up in ziploc bags so they wouldn't get lost, damaged, or mixed up. Apple Oatmeal - Brownish, lightly speckled soap (2 bars). Cherry Almond - Light blue bar. Cocoa-Nilla Coffee - Brown & tan swirled bar with dark brown speckles. Cucumber Melon - White/off-white bar. Naked - Whiteish bars (2 bars). Rain - Smaller white cube & round (2 soaps). Spa - Dark blue & green swirl bar. Of those she sent me, my favorites were definitely the Apple Oatmeal, Bastile, Cherry Almond, Cucumber Melon, and Rain. Each of them are distinct, smell amazing without being overpowering, and are just the right size for comfortable use. The first picture is a shot of all my favorites of the bunch. The second is a picture of the Apple Oatmeal, which was, among my favorites, my favorite. It smells great, and the scent persists pleasantly after my hands are dry. The speckles are oatmeal, which makes it great for scrubbing. There was some question about the batch of scent she made the Apple Oatmeal with being tainted, but I used the soap and it didn't make me break out, so it must have been fine since I have extremely sensitive skin. Of those she sent me, the only one I didn't much care for was the Spa. It smells really good, but I didn't use it because it's really strong. Matt, however, really liked it! Also, I really liked the Choco-Nilla Coffee, but I had to break the bar up because it was enormous and my hands weren't big enough to turn it over to work a lather, otherwise, the texture was really nice! All of the soaps she sent me lathered really beautifully and left my skin feeling very soft and clean! The Bastile, which I put in the kitchen, also took the scent of onion out of my hands and made my rings shine. Its light, pretty scent is great! Thanks for the soaps, Mayren, I've really enjoyed them! You rock! !